A while back the NYT did a story about shy people. The author talked about schools of fish and personality distribution therein. Most of the fish are gregarious and social and brave and adventurous. A smaller proportion of the fish are nervous. They are shy and hesitant and don’t jump into anything too precipitously. There are advantages to both kinds of fish. They nervous fish are cagey. When a new predator is introduced into the environment, the gregarious fish swim up, wanting to make friends, and are instantly eaten. The nervous fish hang back and survive. But when all the fish are introduced to a new environment, the gregarious fish start adapting and quickly thrive. The nervous fish get all trembly and stop eating and eventually die. I am a nervous fish. I haven’t died from transitioning yet, but I do get all trembly and often I’ll stop eating for a while. My husband is a gregarious fish. He jumps right into everything. Our responses to new stimuli could not be more opposite. When we meet new people, at the exact moment that I’ve concluded that they probably won’t kill us, Andy has decided that we can start asking them for favors. And then I die. Or he decides that we should do something before I have had a chance to calculate all the risks and know that it is safe to proceed. My favorite story that demonstrates our differences most clearly is the story of the seals. We were in La Jolla, California, watching the seals on the beach. There are signs posted saying not to get within 50 feet of the seals, but lots of people were getting closer and Andy wanted to get closer, too. That made me very nervous, but he gently pushed me along. After a whole, an authority of some kind came along and said, in a low-key and friendly way, “Alright people, you need to give the seals some space.” Andy turned to look at me to say we should start heading back, but I was already gone. Long gone. I had left him to his rule-breaking fate. All this to say, if you ever need to bet on who is more likely to go to jail for seal encroachment, do not bet on me. I’ve been thinking lately that I got the raw-end of fish personalities, because being a gregarious fish seems so much more helpful in day-to-day normal suburban life. Until we are confronted with a new predator, my skills of not trusting anyone and being transition-averse aren’t likely to come in handy for much. But I’ve been trying to think about the upsides of being a nervous fish. The article that talks about the fish lists several--usually nervous or “sitter” fish type people tend to be deep thinkers, exhibit pro-social behavior, and are less likely to get into car accidents. Some of those apply to me. I am cautious. I am a diligent and thorough planner. I am a rule-follower in the core of my being and I don’t usually get in trouble (until Andy makes me encroach on seals). I am dependable and steady. And gregarious fish can be those things too, I’m just saying that all of those thing come very naturally to me. Of course, it’s possible to be too-nervous of a fish. Sometimes I need to stretch myself. Being married to Andy helps a lot, like last fall when we went on a semi-spontaneous trip to Scandinavia, or when he encourages me to get out there and try something new. Also, the longer I live, the more experiences I have of new things and people not killing me, so I am getting braver over time. I also help him, by slowing him down a little bit, and helping him to calculate his risks. I have been trying to get him to drive a little more cautiously, but Southern California habits die hard. And I am so ready for whatever aliens/robots/monsters try and eat us. 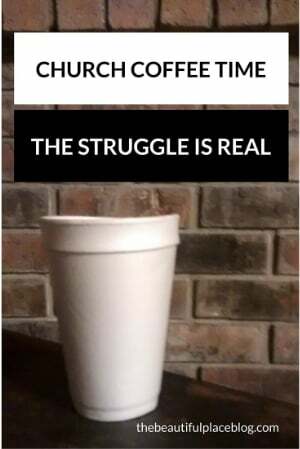 Church coffee time. The time in between the church service and Sunday school, when people stand around with watery coffee and chit chat. A chance to fellowship with believers, learn what’s going on in each other’s lives, catch up, and generally be friendly, encouraging, and supportive. What could possibly go wrong? It’s not the people I’m talking to that are the problem (usually). Most of the time people are kind, and interested, and caring. The major problem is that I am shy and not great at small talk. This is an event that is built all around small talk. Even when you’re talking with your friends, there’s only so much you can discuss in a crowded church lobby. So essentially you are attending an early morning cocktail party with no booze. I suppose the social lubrication is supposed to be supplied by the Holy Spirit, but as one of the frozen chosen, sociability has never been one of my spiritual gifts. Right now it’s pretty chic to be an introvert. There was the book Quiet: The Power of Introverts in a World Which Can’t Stop Talking, by Susan Cain, which put introverts on the cultural map in a big way. Since that book came out, there have been approximately one billion Buzzfeed articles and other various listicles explaining introverts to the population and to themselves. I read a good-sized portion of those articles, because I have always identified as an introvert. I have tested as an introvert on every Myers-Briggs test I have ever taken. I hate most big group situations. My husband thrives on walking down crowded city streets; I get overwhelmed by the mere existence of all those people. I don’t mind being by myself. But since we got married, a weird thing happened. Andy started accusing me of being an extrovert. We would go out with a group of friends and I would come back bouncing with energy. When I see my family I get so excited that I am insanely hyper for over 24 hours and sometimes I get so amped up that I give myself a migraine (As Lisa says, it's for love) . I like to plan big parties. My husband looked at all these behaviors and diagnosed: extrovert. Well then, what if I wasn’t introverted at all, but shy? I started looking at the data. I remember crying on several occasions during my childhood when my mom wanted me to call an adult on the phone. Once I needed to call a friend’s mom to see if I had left a retainer at her house after a sleepover. Once I had to call a store to see if they had any similar products to the invention that I was making for the Young Inventor’s Fair. I wailed for HOURS about both of these situations, begging my mom to not be so cruel as to make me talk to strangers! On the phone!